Oh man. Caramel apples. What. a. treat. Every time there’s a fair during the fall, these babies show up, and make my freakin’ day. 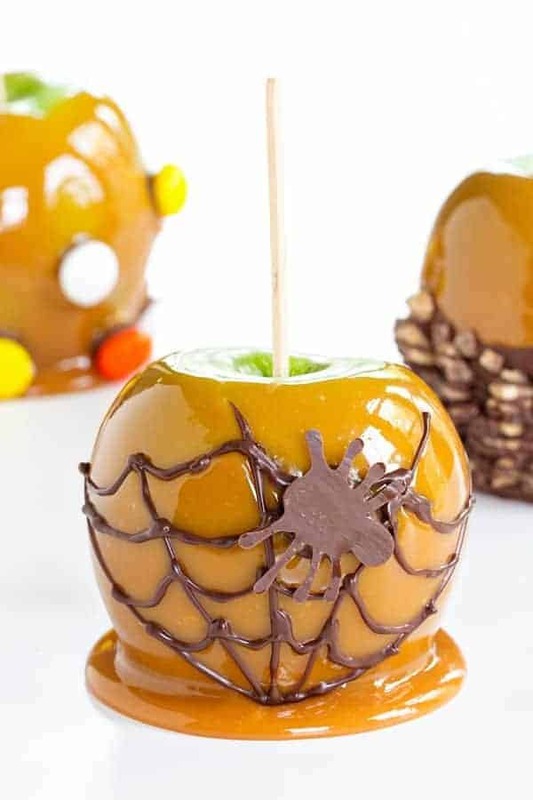 I love, love, love caramel apples so much. It’s kind of silly how much. When we go to Disney World, I love checking out all their super cool creations, especially the adorable ones with Oreos for Mickey ears. This year, I decided we’d skip the fair’s version, and make our own at home. Why? Because I have a toddler that is ALL about Halloween this year. We’re going all out, you guys. 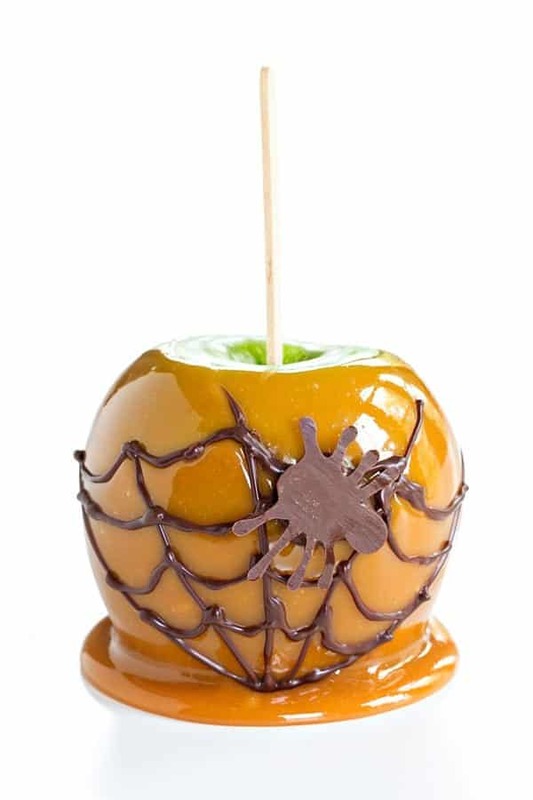 Everything is decorated within an inch of its life, and these Caramel Apples are no exception. I’ve covered them in piped spider webs, festive candies, pecans and toffee bits. They are so fun to look at, make an impressive display for your party table, and best of all – who doesn’t love noshing on one of these while you sit around a campfire and talk the next big holiday’s (yes, I’m already thinking about Thanksgiving) plans. Don’t be afraid of making your own caramel sauce. It’s super simple. 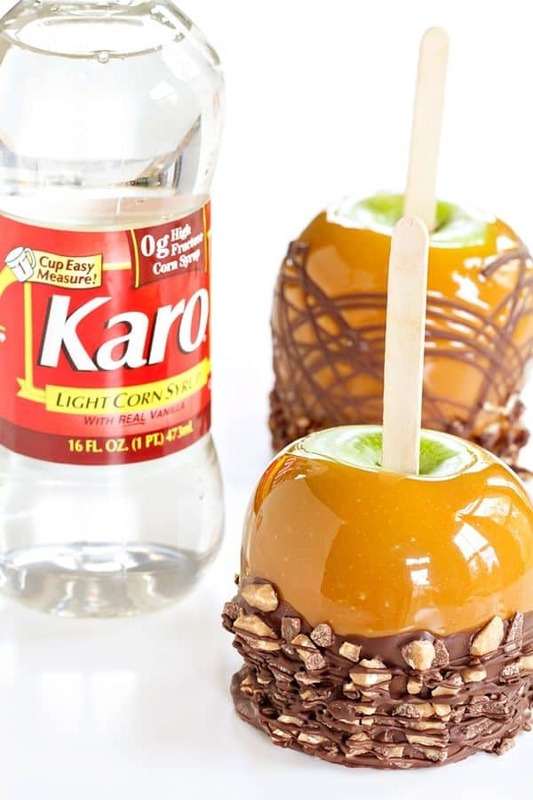 All you need are caramel candies, and to provide the perfect amount of sweetness, a bit of Karo® Syrup. That really is it! I’ve made my caramel sauce a little different this year, by adding in a bit of apple pie spice. Let me tell you something.. I’ve never had a spiced caramel apple before, and I may never have anything but, from now on. It takes your Caramel Apple up a notch by making it taste like apple pie! Not gonna lie, I’ve been patting myself on the back about that last minute addition, because it is simply amazing. The apples and toppings are all at your own discretion. I like green apples better, but Elle and Eric prefer red, so we’re doing a selection here for Halloween. Candy corn, sprinkles, your favorite festive candies – any toppings you (or Disney World) can think of, are game. Just make sure you have your assembly line ready, because the time to stick those things on is as you pull the apples out of the caramel. Don’t wait too long, or they’ll have trouble sticking. Crush up some Oreos for a fun dunkable topping, pecans and toffee bits are delish too. Just don’t forget lots and lots of candy eyes, or chocolate spiders to to make them adorably spooky for Halloween. Who’s with me? 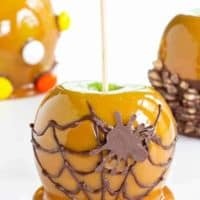 Let’s make Halloween extra fun this year with some Halloween Caramel Apples! pecans, toffee bits, chocolate melting wafers, seasonal candies, etc. Spray a baking sheet with cooking spray or line with parchment paper; set aside. Wash and dry apples; insert stick into stem end. Microwave caramels and corn syrup on HIGH (100%) in a small, deep microwave-safe bowl for 2 to 3 minutes or until caramels are melted, stirring once during cooking time. Stir in apple pie spice and vanilla extract. Dip apples in hot caramel mixture turning to coat well. Allow caramel to drip from apples for a few seconds, then scrape excess caramel from bottoms of apples. Dip bottoms of apples into desired candies, turning to coat. Place dipped apples in prepared pan. Chill apples for 10 minutes or until chocolate is firm. Wrap apples individually if desired; store in refrigerator. Tip: Use COLD apples when dipping so less caramel slides off. 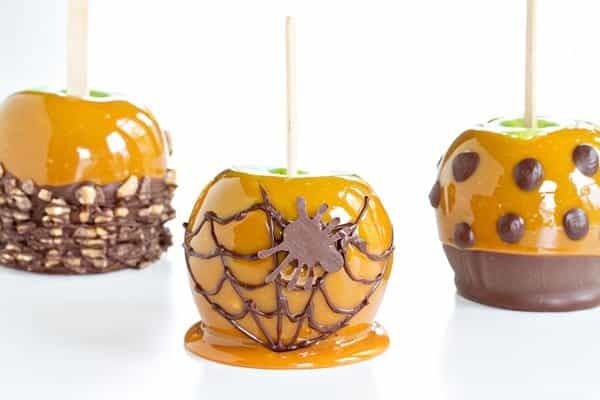 These caramel apples are so pretty! I need to try these out!